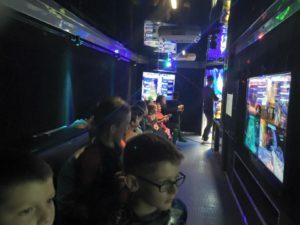 The best mobile party idea in Edmonton! We have TWO mobile video game trucks and trailers serving Edmonton, Sherwood Park, St. Albert and the surrounding Alberta area! We have two game trucks for more availability! Up to 28 can play at one time! Book your iPlay Game Theatre party today! The best birthday party in Edmonton, Sherwood Park and St. Albert comes right to you! Our video game trucks rock! Edmonton, Alberta’s best video game party! This is the ULTIMATE Party in Edmonton, Sherwood Park and St. Albert! Our luxury video game trucks and trailers come right to you ! We bring the best games, best gaming consoles, HUGE high-definition TV’s, awesome lights and sound, and so much more! With 7 HUGE TV’s, up to 28 guests can play at once! Birthday Parties, Church and School Events, Fundraiser, Fairs and Festivals, even Tailgate Parties… iPlay Game Theatre is your best mobile party entertainment value! We serve the Edmonton, AB area in a 150 km radius! See our Service Area for more information! Our Game Coach runs the party while you relax! We set up and we clean up! 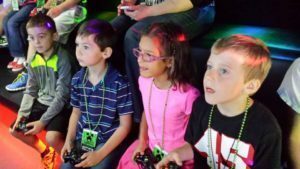 Book your iPlay Game Theatre party today!